Baseball fans have craved ways to commemorate the biggest and brightest moments of this year’s exciting MLB season and Topps NOW™ physical baseball cards continue to offer a unique collectible to celebrate those moments every day. The Topps NOW cards, available for only 24 hours exclusively on Topps.com and then never offered again, captured those many moments throughout the season for baseball fans as the on-demand trading card program reached an incredible milestone with 1 million cards sold. Topps NOW launched in 2016 from the exclusive trading card partner of MLB, commemorating amazing moments such as New York Mets pitcher Bartolo Colon’s epic home run, Ichiro’s 3,000th MLB career hit, and the captivating World Series title run for the Chicago Cubs. This year’s Topps NOW moments have been led by top rookies such as New York Yankees Aaron Judge and Los Angeles Dodgers Cody Bellinger. Judge’s meteoric rise with his impressive rookie season has also set Topps NOW records, which led Topps NOW to the monumental 1-million mark. The Topps NOW card featuring Judge’s record-breaking 50th home run as a rookie sold 16,138 copies, which broke the Topps NOW single-card record by nearly 5,000 cards. 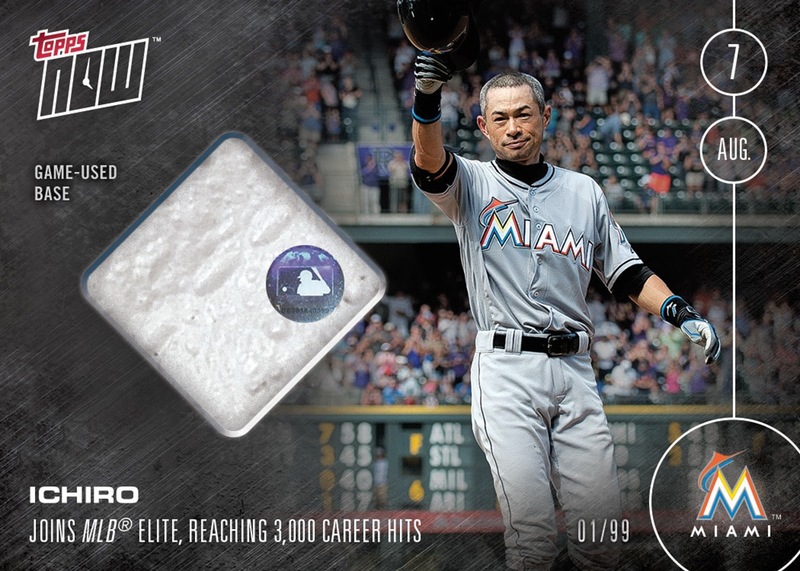 The Topps NOW card commemorating Ichiro’s 3,000th career from 2016 held the previous record, which stood at 11,550. In total, Judge’s Topps NOW cards have sold nearly 100,000 copies. However, Judge’s Topps NOW cards aren’t simply about breaking records. Topps NOW has given baseball fans a different way to chronicle what has turned into an incredible soon-to-be award-winning season. Topps NOW MLB cards will continue throughout the postseason, capturing all the great playoff moments with the inevitable moment the World Series champion emerges. Visit Topps.com daily to see the exclusive Topps NOW cards.